Super chocolaty pound cake topped with a cheesecake batter then swirled to look a galaxy. I normally am not one to follow a trend or like a trend at all but I like the galaxy one. The patterns that I have seen come in different colors like blues, pinks, purple, reds, I've even seen orange and a black background. You can create your own pattern and use colors that you like. Be creative with this one. 1. Preheat oven to 350 degrees. Prep two 9" loaf pan or tube cake pan with nonstick cooking spray. For the loaf pan, cut a sheet of parchment in half and place in pan for easy lifting. 2. In a medium bowl, combine flour, baking powder, sea salt, and cocoa powder. Set aside. In a large bowl, cream together butter and sugar for 5 minutes or until light and fluffy. Scrap the sides. Add sour cream, vanilla extract and eggs one at a time. 3. Add 1/3 of the flour mixture then 1/2 of the buttermilk, continue starting with flour and ending with flour. Fold in chocolate chips. 4. Cream together cream cheese, sour cream, sugar, salt and vanilla until smooth. Divide into three bowl then add food color to each bowl. Spoon out cream cheese batter on top cake then swirl to desired pattern. Add sprinkles and/or nonpareils and gently pat in. 5. Cover loaf pans or tube aluminum foil and bake for 40 minutes covers. Remove foil and bake for 10 to 15 minutes or until a cake tester comes clean. Let cool in pan for 15 minutes then transfer to a wired rack to cool completely. Cheesecake and chocolate cake?! Sign me up! I really like the galaxy trend too . . . it's so pretty and every design is unique. This looks so amazingly delicious! My kids have been helping me in the kitchen lately and I think they would love to mix all the food coloring in the cake. Thank you for the recipe! This looks fabulous and so much fun to let the kiddos help with! We are definitely adding it to our next girls sleep over! I love a good pound cake! Wow, I never knew cakes can be so fun and creative. It is my first time to see galaxy cake. Super Chocolaty is what I love, I shall try to it out and impressed my family! This is incredible! I love how the colours stayed really vibrant even after baked. You're so making me crave pound cake. Yum! Wow this looks really good!! This is so cute! And now I want cake haha! Not only does that look so pretty, but it sounds amazing... I think my kiddos would like helping me make something like this! we might have to do an Easter color theme and try it out! :) Thanks for the idea!! Not only does this look fantastic, but the recipe sounds amazing as well. My twins, Guardian of the Galaxy fans, would get a kick out of this! This recipe looks amazing. We definitely need to try to make it. This looks really fun, but it also really looks like something that I could totally mess up. Still might try it though! What the heck that looks amazing! What an amazing looking cake, I will surely try making this for my cousin's birthday next week. That looks fun and sounds delicious! We’re doing a solar system study in our homeschool. The kids would die if I made this cake to celebrate the end! what an incredible looking cake.. those wilton gel colors look great! would you recommend? This would be fun for a space party! My husband's son is enamored with the whole galaxy trend. I love the esspresso powder - nice touch. My kids would go crazy over this. I'm just not a talented baker. I may have to ask my Mother-in-law to make this with my daughter. This is the coolest cake I’ve ever seen! I’m trying it! I love how colourful this is. I'm a complete chocoholic! Looks tasty and unique. It also looks fun to make! Great job! This cake sounds delicious! And I know my youngest would love the whole galaxy swirl theme. She's all about space phenomena in art and food right now. That sounds amazing and love oks wonderful! I’ll have to make some for my daughter! Looks so fun! Such a unique idea! Wow, what an awesome looking cake! Plus it includes cheesecake?! My mouth is watering! This looks AMAZING. I love using sour cream in my cakes! Gives the cake that perfect moisture and good flavor. I have a feeling I'd mess up the galaxy look, but I'll look into it. I have so much leftover food coloring from the holidays. Your pound cake looks so colorful delicious! I have to try the recipe! This looks so fun and delicious! LOVEEE the colors of this! My niece and nephew would love to make and eat this (me tooo)! I am always a fan of pound cakes, I know it's stereotypical but as a housewife they're really my kind of thing! Thanks for the other recommendations as well, I'm gonna try the Spiced Cranberry one as well. Oh this looks so delicious and colorful! It looks so attractive. How i can eat this if is so pretty! lol! I've made a lot of pound cakes before but never a galaxy one. This looks awesome and thanks for the recipe. I'd love to give this a try! I'm sure the kids will like it too. I really like the way this pound cake turned out. I bet my girls would get a kick out of making it. Such a colorful treat! wow! 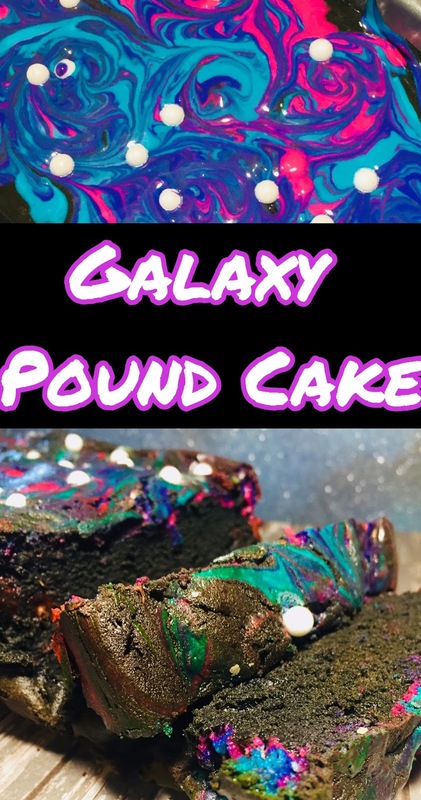 that looks so amazing, i don't think I can pull off the galaxy look but I will try this recipe on a weekend when i crave doing something creative! The galaxy trend is one that I love too! I've seen recipes for donuts but never pound cake. My daughter would love to try making this. these are so colorful and fun! Yummmm. Looks like a galaxy dream. Put it in my tummy! Almost to beautiful to eat! It looks so delicious! Love creative cakes! My mom is a baker. I'll have to share this recipe with her. She is always looking for interesting new recipes. You are so creative! Not only does your food sound delicious, but it looks amazing too! I must try this! Oh yummmm! Have been eating a lot of sweets lately, and have been meaning to quit but after seeing this, and the fact that ive never tried pound came before...it is soooo tempting! Oh how fun! My little brother loves to bake, he just made a cake & tried the shiny marble cake icing. I'm going to show him this idea, I'm sure he will be itching to get started! Wow these look so yummy, I am a huge fan of brownies so I will need to add these too try out. One question I do have is did the food coloring alter the taste of the brownies though since it’s so much? Not at all. I didn't have to use a lot of food coloring so it didn't have a aftertaste. That is one fun pound cake! I bet the kids have a great time making some too. That looks soo cool! I bet it taste delicious too. I need to get my hands on those neon food coloring! This cake is so colorful and fun and I am guessing it tastes just as good as it looks! This would be the perfect dessert to bring to a party -- you'd be the talk of the party. This is a gorgeous recipe. It would be great for a themed Star Wars or Guardians of the Galaxy party - the bread looks space/galactic-like. I love it! What a great twist to have some colour! Oh yummy yum yum. <u niece loves Scythian space related she will go crazy for these. Your pound cake looks very galactic, my kids would love to help make it and eat it too. This cake is so pretty! I love all the different colors!!! The cake looks so festive and delicious! i think to ask it for my birthday which is very soon! I have made a couple pound cakes before. Of course nothing as pretty as this. My kids would love these colors. My kids would go crazy for this cake! They love chocolate and cheesecake and they would love all the pretty colors!